As parents and concerned citizens I’m sure most of us at one time or another have been confronted with the question of lead poisoning. But have you asked yourself what your government is doing to protect your children from lead contained in toys? The answer? They’re banning toys, taking books from schools and libraries, hurting low income families, killing entrepreneurial spirit and risking putting the economy in an even greater depression than we’ve seen in decades. I’d like to introduce you to their solution: the CPSIA. Do you know about the CPSIA? No? Then I ask you to take a few minutes to find out about it. The CPSIA stands for Consumer Product Safety Improvement Act, a new set of laws that will come into effect on 10 February, 2009 and will impact many, many people in a negative way. Make no mistake, this is very real. View it for yourself. If Forbes, the American Library Association and numerous other media are paying attention, perhaps you should too. Due to the new law, expect to see the cost of school supplies sky rocket. While those paper clips weren’t originally intended for your student to use, they will need to be tested now that your 11-year-old needs them for his school project. This law applies to any and all school supplies (textbooks, pencils, crayons, paper, etc.) being used by children under 12. Due to the new law, all children’s books will be pulled from library and school shelves, as there is no exemption for them. That’s okay though, there’s always television. Our children don’t need to learn the love of reading after all. Due to the new law, you will now be given a cotton ball and an instruction manual so you can make it yourself since that blanket you originally had your eye on for $50 will now cost you around $1,000 after it’s passed testing. It won’t even be the one-of-a-kind blanket you were hoping for. Items are destroyed in the testing process making one-of-a-kind items virtually impossible. So that gorgeous hand-knit hat you bought your child this past winter won’t be available next winter. Due to the new law, all items in non-compliance will now be dumped into our already overflowing landfills. Imagine not just products from the small business owners, but the Big Box Stores as well. You can’t sell it so you must toss it. Or be potentially sued for selling it. You can’t even give them away. If you are caught, it is still a violation. Due to the new law, you will now need to spend $20 for that brand new pair of jeans for your 2-year old, rather than shop at the Goodwill for second hand. Many resale shops are eliminating children’s items all together to avoid future lawsuits. Due to this new law, you will be forced to adhere to strict testing of your unique products or discontinue to make and/or sell them. Small businesses will be likely to be unable to afford the cost of testing and be forced to close up shop. Due to the current economic state, you’ll have to hope for the best when it comes to finding a new job in Corporate America. Already struggling under an economy that hasn’t been this weak in decades, the American economy will be hit harder with the inevitable loss of jobs and revenues from suppliers, small businesses and consumers. The required testing is far too costly and restrictive for small businesses or individuals to undertake. Due to this new law, many foreign manufacturers have already pulled out of the US market. You can imagine the impact of this on their businesses. If you think this is exaggerating, here is a recent article from Forbes. And for those of you prepared to be stupefied and boggled, The New Law. Help us make a one-stop database of information from natural suppliers. Know the answers to “Is your wool tested?” or “Does your doll skin include lead?” Add them to our database so we can all be informed! I sat at home. Alone. Curled up in front of our TV. A cup of coffee clutched in my hand. My thesis is sitting somewhere on one of the many bookshelves in our house, probably all covered in dust. I can’t even find it. But then. Who cares? It is all history now! So what of it now? President Obama’s speech was very little about that. It was about the new challenges the US and all of us living on this planet face. He barely touched the subject of racism. The fact that he is president now has laid the world’s doubts to rest. In America anyone can become what he wants to be. Everyone’s dream can come true! To me the most amazing thing about his speech was how he found a way to address everybody and be all inclusive. He talks about ” The Makers of Things” in America who toil in obscurity. Hey, that is us! Doll makers and artists on Etsy! He talks about the immigrants who crossed dangerous waters leaving family, friends, everything behind. Arriving with nothing but a suitcase. Hey, that is me too! I am the modern day immigrant. I came with one suitcase of clothes. I had to make some hard choices. I shipped my favorite books only! So what does this speech mean to me? It is all about hard work and hope! Mr. Obama tells us that we must work hard to make our dreams come true. I feel like I have been doing that. I have worked to so hard to get my little business off the ground. But now it is threatened by a crazy law that did not take into account people like us, the Natural Kids team. So my plea is to you, Mr President, to hear our voices! The voices of the people, crafters, stay-at-home mothers, small business owners to amend this law. So we can get our due measure of happiness which we have been working so hard for. We don’t want hand-outs from the government. All we want is the right to continue doing our job: Which is creating wonderful children’s items out of natural fibers and recycled, or up cycled materials. There must be a place for us in this new, better, greener world – under your reign. Free at last! Free at last! Free at last! from this mindless horrible law! During Christmas most online sellers experience a high volume of sales. But even if you don’t have many sales yet – (don’t be sad they will come in time!) – it is crucial to stay organized when you run an online business. So today I want to give a little pep talk on how to keep your ducks in a row. Nothing makes a customer more happy than receiving their order in a speedy fashion. Of course, you want to make sure that while sending things fast you don’t send the wrong item to the wrong person. 1.Write yourself a note for every order that comes in! I stick these notes on the window behind my sewing machine. Since I work on a “first-come-first-serve basis” I arrange the orders by date they were received on. As I work on the orders and ship the items I take the sticky notes off the window and rearrange them! It really works well! If it is a bigger custom order I use a big sheet of paper to write every detail down! 2.When I get ready to wrap and ship items I have noticed that it is important to attach the name to each item you wrap up! Nothing more annoying than having a nicely wrapped gift sitting on your table and not knowing who it needs to go to. Or even worse having it all boxed up and taped without the address on the box…That’s a real time waster! I like to wrap doll clothes in tissue paper, use organic ruffia for ribbon, and tie a “thank you” note and Moo card with ribbon to it. If the note is personalized – has the name of the buyer – it gives it a nice personal touch while at the same time helping you to identify the wrapped item =). 3. Getting it ready for shipping: Next I take my sticky note with the address, stick it on my outer packaging, cross reference the etsy address with the one given on paypal. Voila! If it all matches I can ship the item out. If not, rats! Now I have to convo the buyer and confirm what address it needs to go to. 4. I take all big orders, doll orders , and international shipments to the Post Office in person. Smaller envelopes I usually hand over to my trusty mail carrier when she delivers my mail. I think this system of mine works really well. But please feel free to comment and add some tips to my list! If you are an artist/crafter and offer custom work in your etsy shop, life in the months before Christmas can get pretty complicated and hectic. How many custom items should I offer? Do I have all the materials to make them? Do I have enough shipping materials, and will I be able to ship it on time? How do I keep my store stocked at the same time? How do I balance the custom work with my desire to create new items?Should I just skip sleep and work 24 hours? Now is the time, right? I have been struggling with these questions since August. I would really like some input from other crafters who offer custom work. How do you stay organized and make it through this busy season? Sometimes I get so tired of the balance act I am performing that I want to stop taking customs orders altogether! But then I get some wonderful Feedback or a really sweet message from someone who received their doll, and I forget all about the stress. 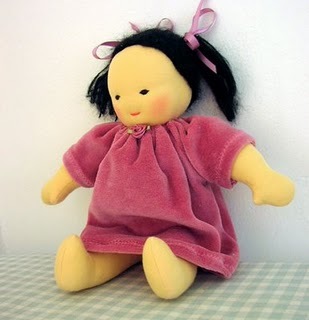 My favorite kind of dolls are ethnic dolls. I made the Asian dolls you see in the pictures for children adopted from China. There is a great need for such items because it is hard to find dolls with Asian and other ethnic features on a regular store shelf. I feel that my work is important and appreciated by the children and parents alike! But I am only one woman. I wish I had some elves to help. Maybe some day my daughter will be old enough to help. But for now it is just me. Hope to hear some opinions from all of you who do customs!